After we finished the first round of apple recipes from our apple picking adventure, we took a little break and cooked how we normally do… By creating an on-the-spot delicious meal with only the ingredients in our fridge and cupboard! Of course, we still had a plethora of apples, so we decided to incorporate some into this dish as well. 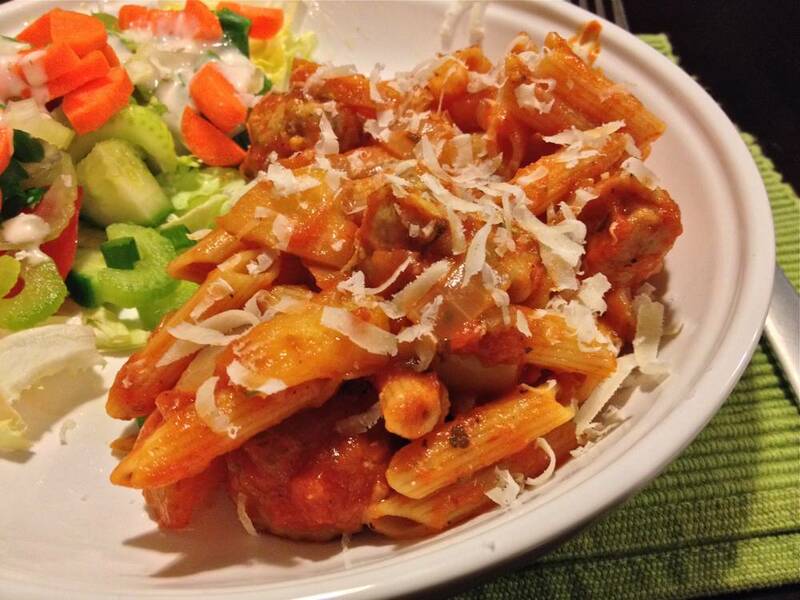 Our Apple and Sausage Penne was one of those “I can’t get enough of this!” meals. It is the perfect blend of sweet and savory, the apples were an unexpected delight, and the sausage made this a wonderfully hearty dish! Bring a pot of water to a boil and cook pasta according to the directions. We used Trader Joes High Fiber Penne, and used about 3/4 of the bag. I always prefer penne when making a chunky pasta, but any type will do! Heat a little olive oil in a large skillet over medium heat. Slice open the casing of the breakfast sausage, crumble, and brown and cook until done. Remove from pan. We used chicken breakfast sausage from Trader Joes because we already had it on hand for another dish, but you can use any kind you like. You could also omit the sausage to make this into a vegetarian meal. 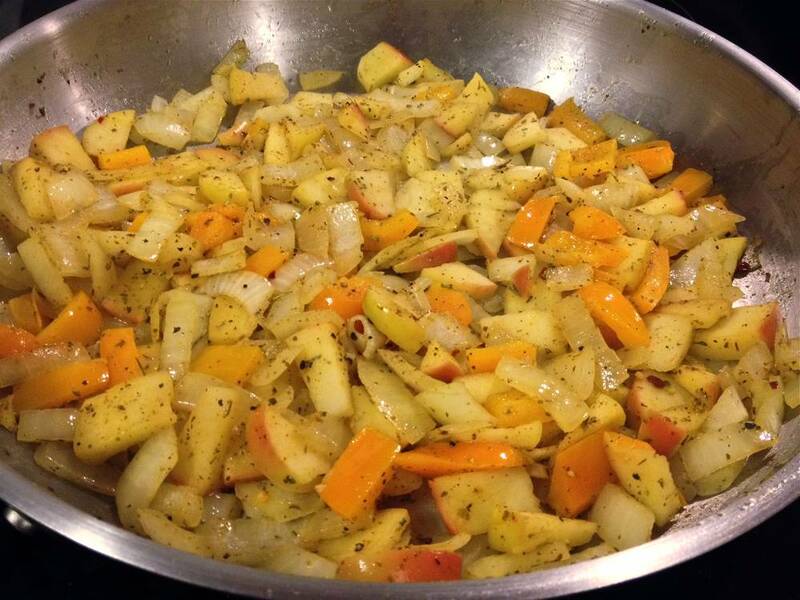 While your sausage is cooking, chop the onion, bell pepper, apple and garlic. 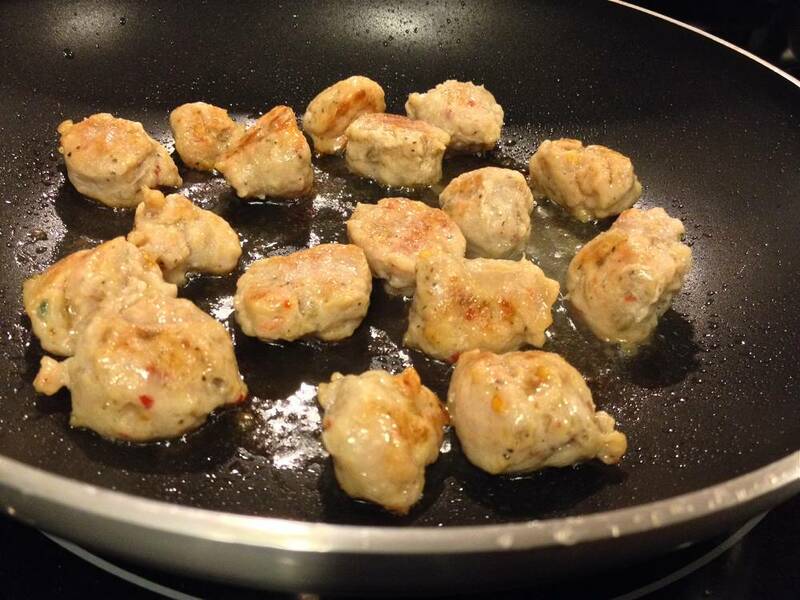 Once your sausage has been removed from the pan, saute your veggies and apple until tender, about 6-8 minutes. Add your spices and garlic, and cook another 1-2 minutes. Add your cooked sausage back into the pan, add your pasta sauce, and cook to heat through. We used Classico Cabernet Marinara, which paired perfectly with the apple since the sauce was a little bit sweet. All that’s left is to combine the sauce mixture and strained pasta, top with Parmesan, and enjoy! I believe this pot lasted 4-5 dinners for two. I seriously can’t wait to make this meal again! It was so warm, comforting, satisfying, and so very tasty! As I mentioned in both my apple picking and 1st apple recipe post, we also walked away with a gallon of apple cider. We were trying to find creative ways to use it up, and one way was… drinks! 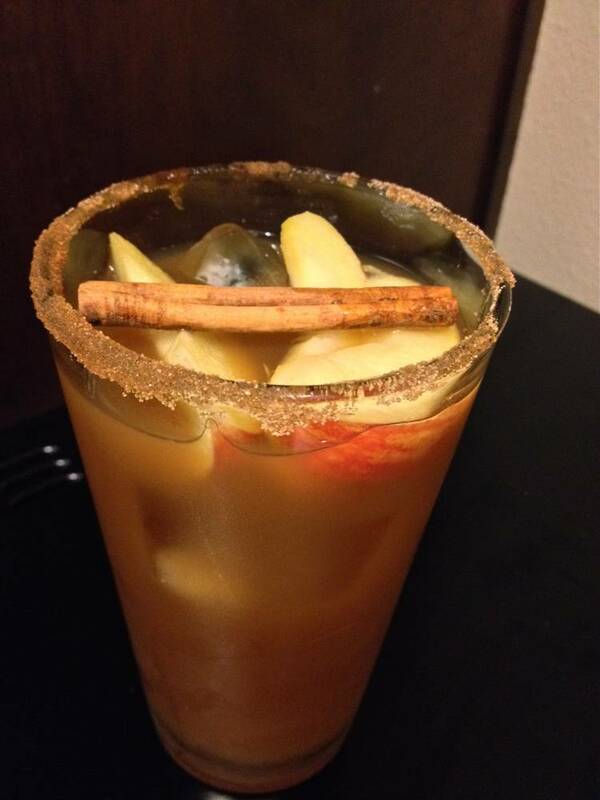 We tried out this Apple Cider Margarita, and it was delicious! We didn’t have Grand Marnier, so we substituted with triple sec instead. We also omitted the orange segments, as we didn’t have any on hand. But we figured the triple sec would add the orange flavor back in. While the drink was great, it was a little strange drinking it with this meal. Probably better paired with dessert, or as dessert itself! I hope you enjoy these recipes, let me know if you try them out! Until next time, Happy Eating!